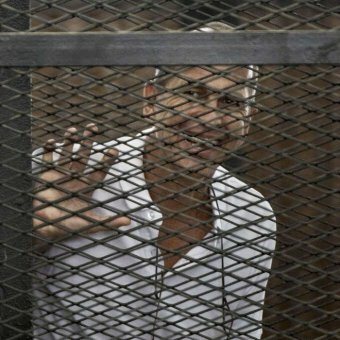 News agency AFP reported Greste and Fahmy were eligible for deportation under a recent law enacted by president al-Sisi allowing the deportation of foreigners to stand trial or serve their sentences in their home countries. Fahmy was expected to be released from prison and deported to Canada within days, a security official said on Sunday. Fahmy's fiance Marwa Omara told news agency Reuters she was "hopeful" he would be freed soon. "His deportation is in its final stages," she said. There was no immediate word on the fate of Mohamed, whose case could be more complex because he does not possess a foreign passport. Al Jazeera's acting director general Mostefa Souag released a statement that said Greste's release was "good news, but not enough" and added the campaign to free the network's journalists would not end until all three men were released. "We're pleased for Peter and his family that they are to be reunited," Mr Souag said. "It has been an incredible and unjustifiable ordeal for them, and they have coped with incredible dignity. "Peter's integrity is not just intact, but has been further enhanced by the fortitude and sacrifice he has shown for his profession of informing the public. "We will not rest until Baher and Mohamed also regain their freedom. The Egyptian authorities have it in their power to finish this properly today, and that is exactly what they must do." In January, an Egyptian appeals court ordered a retrial of the three men. After the decision, Greste's parents Lois and Juris Greste said they would push to have their son deported before a second trial. At the time, Greste's family said the deportation option had been strengthened because the retrial order meant his status changed from being a convicted person to merely being accused. Australian journalist Peter Greste has been deported from Egypt after 400 days behind bars, and has flown to Cypruson his way home to Australia. Greste was set free by order of Egypt's president Abdel Fattah al-Sisi issued under a new law allowing foreign prisoners to be deported. The Al Jazeera journalist travelled straight to the airport with his brother, and was said to be in good health when he boarded the plane to Cyprus. There was no official word on the fate of his two colleagues - Canadian-Egyptian Mohamed Fahmy and Egyptian national Baher Mohamed - who were also jailed in a case that provoked an international outcry. Greste's family, who will hold a press conference in Brisbane later this morning, confirmed his release from jail in a statement posted on social media.